States, currently occupies only 5% of its historic range. There are fewer than 70 breeding individuals. puma from a closely related subspecies (P. c. stanleyana) has apparently been successful in mitigating inbreeding problems . controversial for its location in prime panther habitat. literature, including miscitations and misrepresentation of data to support unsound conclusions - in short, bad science (Beier et al. In recent years, the Florida Panther has seen its population triple in size. Cat Specialist Group (1996). 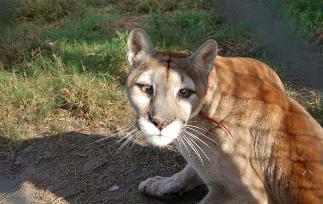 Puma concolor ssp. coryi. 2006 IUCN Red List of Threatened Species. IUCN 2006.
panther. Journal of Wildlife Management 70:1-7. Kostyack, J and K Hill. 2005. Giving Away the Store. Kostyack, J and K Hill. 2004. Discrediting a Decade of Panther Science: Implications of the Scientific Review Team Report. 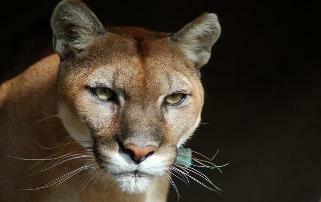 More Information on the Florida Panther...Click Here! Copyright © 2007,Genesis Zoological Center Inc.
storm and is a very affectionate and loving cat.